My Summary: Zach is getting older, but that doesn't mean he doesn't still enjoy playing with his friends Poppy and Alice. But when his dad throws out his toys, Zach can only think of one thing to do: end the game forever. 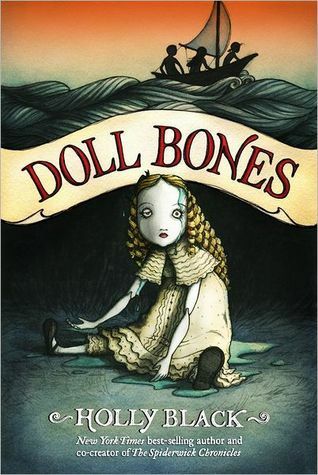 Zach thinks that's the end of their friendship, but when Poppy and Alice appear outside his window late one night with a haunting tale of murder and bone china dolls, he can't help but jump at the opportunity for one last adventure. My Thoughts: What a great read! I was sucked in immediately by the creepy premise, and I couldn't put it down. Although 244 pages may seem like a lot for a MG novel, it read quickly and didn't take more than 4 hours to complete. Black's writing brought the story to life, and I loved the way she included the childrens' real life issues into the story along with the paranormal aspect. The characters themselves were likable and easy to relate to, and the idea of the 'game' having brought the doll to life was great. Final Thoughts: I definitely recommend this novel to anyone who enjoys ghost stories, paranormal and adventure novels, and of course fans of Holly's other series. What's your favourite literary quote? I really can't choose, and it's not due to a lack of trying. I have so many literary quotes floating around that I absolutely adore - I really can't choose my favourite. One of my favourites is probably the one under the header of this blog, though! Franz Kafka perfectly described that feeling an amazing book gives you when you're finished - you really do feel like you've been wounded, and it's not the kind of wound that you can slap a band-aid over. Thanks for visiting my blog! Please feel free to have a look around, and don't worry, I always follow back! Summary (from Goodreads): Pattyn Von Stratten’s father is dead, and Pattyn is on the run. After far too many years of abuse at the hands of her father, and after the tragic loss of her beloved Ethan and their unborn child, Pattyn is desperate for peace. Only her sister Jackie knows what happened that night, but she is stuck at home with their mother, who clings to normalcy by allowing the truth to be covered up by their domineering community leaders. Her father might be finally gone, but without Pattyn, Jackie is desperately isolated. Alone and in disguise, Pattyn starts a new life, but is it even possible to rebuild a life when everything you’ve known has burned to ash and lies seem far safer than the truth? Disclaimer: I received a copy of this book from the publisher in exchange for an honest an unbiased review. My Summary: Pattyn is on the run - a fugitive, forced out of her small Mormon community because of the part she played in her fathers death. But the death of her father means nothing in comparison to the deaths of her baby and her boyfriend, Ethan. My Thoughts: I loved Burned, so when I heard that there was a sequel in the works, I was a little wary (albeit excited). When I found a copy sitting in my mailbox a few days ago, I knew it was going to be another one of those nights when I stayed up late reading. Pattyn and Jackie were extremely well-developed. I loved the way their stories started off in the same place, branched out, and then connected again. The supporting characters were also really well-written - I loved Gavin and Angel and Adriana. Jackie's struggle to move on was heartbreaking, and reading about her mother's indifference infuriated me. I found myself cheering on Pattyn, hoping she found what she was looking for and got the chance to move on. While abuse was a major theme in this novel, I found hope to be one as well. Moving on was a big one too, and Ellen Hopkins wrote it beautifully. Jackie and Pattyn's struggles were believable and relatable, and nothing was sugarcoated. Final Thoughts: If you are a fan of poetry, contemporary lit, or just looking to branch out in the YA genre, I definitely recommend you check out anything and everything by Ellen Hopkins. 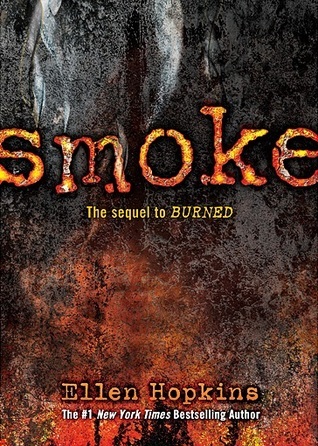 If you loved Burned, pre-order Smoke ASAP! Summary (from Goodreads): Italy, 1453. Luca and Isolde grow more and more attracted to each other as they continue their journey to unravel the mysteries throughout Christendom. But their travels are delayed by the uprising of an intense religious crusade that threatens the balance of the civilized world. Death lingers in the air as war ravages on, but this religious conflict is nothing compared to the arrival of an intense and deadly storm. My Summary: When Luca, Isolde, and their companions set out on their journey, they never expected to be swept up in the strange superstitious fears of a tiny town along the road. Approached by a self-proclaimed 'saint' and a group of wayward children, the five are baffled to discover the townspeople fear... well, almost everything. 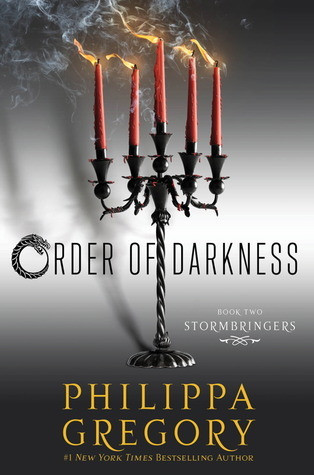 My Thoughts: In this second installment of Philippa Gregory's Order of Darkness series, we see our foursome continue on the quest for truth in the world of Christianity. We see the relationship between Isolde and Luca grow as the journey progresses, with each perilous step bringing them closer to the sinister truth - and to each other. I've always been a huge fan of Philippa Gregory's. Her trademark world-building was evident in this novel as well as in the first installment, and her attention to detail really brought Isolde and Luca's world to life in my mind. The pacing was very well thought-out, and I never felt like the story dragged. There was also a lot of symbolism present, adding that extra element of intrigue to the atmosphere. Final Thoughts: A really enjoyable read for those who love historical fiction, fantasy, and romance. I'm already anxiously awaiting the third installment! Summary (from Goodreads): Caroline Reynolds has a fantastic new apartment in San Francisco, a KitchenAid mixer, and no O (and we’re not talking Oprah here, folks). She has a flourishing design career, an office overlooking the bay, a killer zucchini bread recipe, and no O. She has Clive (the best cat ever), great friends, a great rack, and no O. My Summary: Caroline Reynolds has her life together. She's scored her dream job, dream apartment, and she couldn't ask for better friends. So why is she unhappy? Because this twenty-something has had horrible experiences with men - the latest of which left a lasting impression on her nether regions. Frustrated, Caroline can't help but feel a little bitter towards her neighbour - a man she nicknames 'Wallbanger' because of the sounds of his late-night activities. But could Wallbanger be the game-changer that gets Caroline out of her rut? My Thoughts: Don't be deceived by the name (or the cover! ).This book was hilarious, and definitely not what you'd expect from the cover art. Hands down, it was one of the funniest books I've read in years. Every character added their own charm to the story, and I was hooked after the first few chapters. I flew through this one in only a few hours, and I was sad to see it end. The characters were great, and I loved the relationship dynamic between Caroline and Simon. Their relationship developed naturally and believably, and never once did I roll my eyes at any forced-sounding words. Clayton definitely knows how to develop her characters. Final Thoughts: I recommend this novel to anyone looking for a hilarious, light-hearted romance.